Our latest research reveals that, although ethnic diversity is improving at a junior level, the industry is still a long way from our target of 15% BAME employees in the top two tiers of creative and media agencies. Welcome to the second part of Campaign and the IPA’s diversity survey. This week, we reveal the industry’s progress on ethnicity and discuss the wider problem of diversity. First, the inevitable disclaimer. Ethnicity feels much more nuanced than gender. Even asking people to self-identify on such lines is contentious, with many believing that this reinforces a feeling of "other". For this feature, we have chosen to use the term BAME (black, Asian and minority ethnic), although it’s not perfect. Overall, 12% of those working in IPA member agencies are from a BAME background. This is slightly lower than the past two years – 13.1% and 13% – but is an increase on 6.1% in 2007, when the IPA first started monitoring ethnicity at agencies. BAME individuals make up about 14% of the UK population, but most of the larger agencies are based in London, where this percentage is higher. In creative agencies, 9.9% of employees were identified as having a BAME background. In media agencies, this figure was 14.4%. Overall, large agencies had a higher percentage of BAME employees than smaller ones. Like the gender survey we covered last week, the figures are not directly comparable with last year’s data as the sample has changed. Last year’s results were based on figures supplied by 31 of the larger agencies. This year, all of the IPA’s member agencies, large and small, were invited to participate and 91 agencies supplied figures on ethnicity. 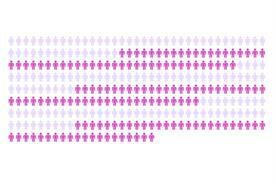 This larger sample size gives us a much clearer picture of the industry’s make-up. But in order to make a direct comparison with last year’s results, we have listed the 23 agencies that suppied figures both this and last year in a separate box below. 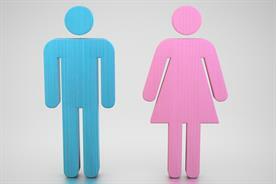 This research only captures data on gender and ethnicity. Of course, diversity is far broader than this. It is not even limited to sexual orientation, age, disability or socioeconomic background – all topics Campaign has covered extensively – but about respecting individuals and the different qualities they bring to work. 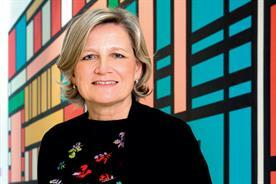 As Aviva’s chief people officer, Sarah Morris, said when Jan Gooding became the insurance company’s first global inclusion director in December: "Inclusion isn’t just about gender or ethnicity, or sexual orientation or age. 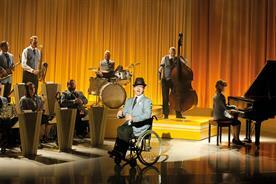 It’s about people and making sure we recognise the diverse talents, experiences and perspectives of everyone at Aviva. 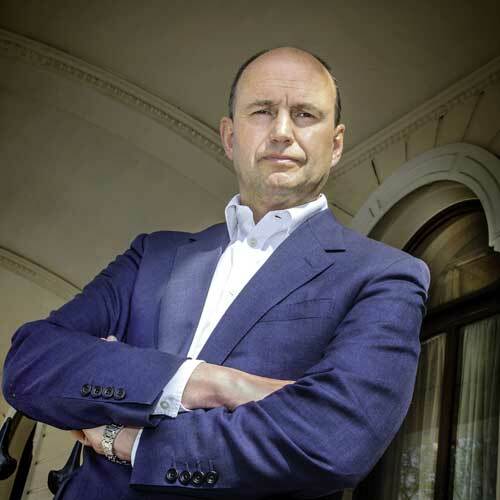 It makes good business sense." Diversity is a challenging area but it’s one that’s worth the investment, because it is a way of ensuring the industry is successful in the future. After all, there is more that unites us than divides us. 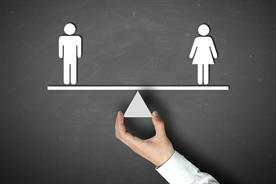 The business case for improving our performance on diversity is clear-cut. McKinsey & Company’s latest research found that companies in the top quartile for gender or racial diversity are more likely to have financial returns above their national industry medians. Diversity of thought leads to greater innovation and creativity, as well as increased staff motivation and retention. Brands know that they need to appeal to the tastes and interests of a culturally diverse society and they want to work with agency teams that look like the Britain of today. The good news is that, at the most junior level, the representation of individuals coming from a BAME background is at the national level of 15%. However, the big issue is that this figure is only 4.7% in the most senior roles and 5.5% in other executive management. If you look at the long-term trend data, starting in 2007 when the IPA first began monitoring ethnic diversity, we can say that we have doubled the representation of people from BAME backgrounds – from 6% to 12%. We have to speed up this rate of improvement if we are to meet our target of 15% by 2020 and we clearly need to work harder to make sure representation filters upwards into the boardroom. The launch of the government’s apprenticeship levy in April will help to drive this by providing agencies with an opportunity to recruit talented young people from a far broader range of backgrounds than the usual graduate "milk round". Also, since 2012, Creative Pioneers, the IPA’s creative apprenticeship programme, has placed more than 600 young people, of whom 25% came from BAME backgrounds. We anticipate that, for this year alone, there will be more than 500 places to be filled. In addition, the IPA sits on the Creative Industries Council diversity subgroup and is collaborating on cross-sector initiatives in 2017 to share best practice and thought leadership. On a more immediate level, the IPA has developed the diversity hub (www.ipa.co.uk/diversity), which provides simple, practical recommendations that can be actioned today. I am pleased that this survey has played a part in raising ethnic diversity much higher up the agenda of agency leadership teams but now it’s all about action. Goethe did not concern himself much with issues of diversity (not a big issue in 18th-century Germany) but he did say the following, which works as a pertinent rallying cry for all of us today: "Knowing is not enough; we must apply. Being willing is not enough; we must do." * Sample size of those supplying BAME statistics is different to those supplying gender statistics. 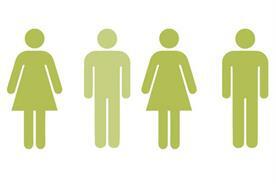 Overall, 12% of employees were identified as having a BAME background. Campaign the IPA’s target is for 15% of the top two tiers of background by 2020. 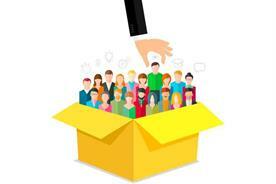 In creative agencies, 9.9% of employees were In media agencies, this figure is 14.4%. 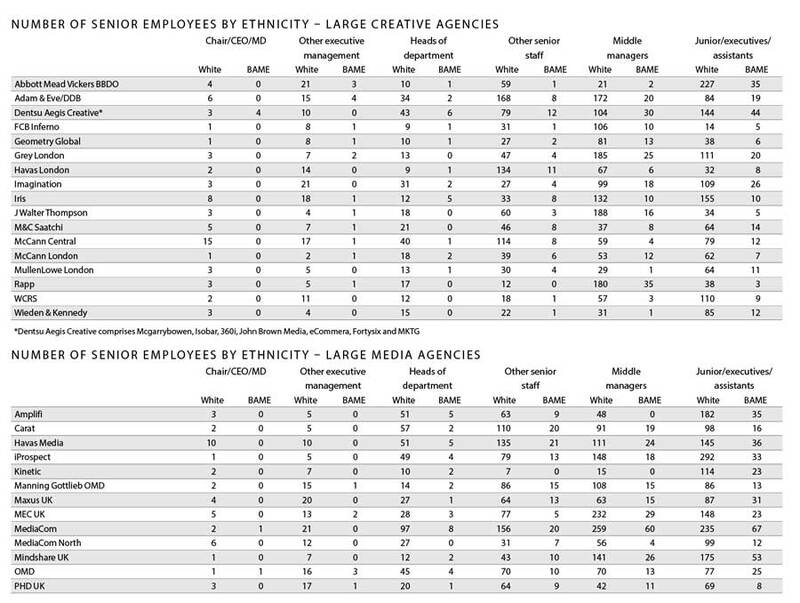 Overall, large agencies had a higher percentage this can partly be explained by large agencies has a different ethnic make-up to other parts of last year, the percentage of BAME staff in the top two tiers remained the same at 7.1%. Larger creative agencies generally have a higher percentage of BAME employees across the different seniority grades compared with their smaller counterparts. For example, 8.5% of "other executive management" in large agencies are from a BAME background compared with 2.2% in smaller agencies, 11.2% of "middle managers" compared with 8.1%, and 14.3% at the most junior level compared with 7.8% for the smaller agencies. 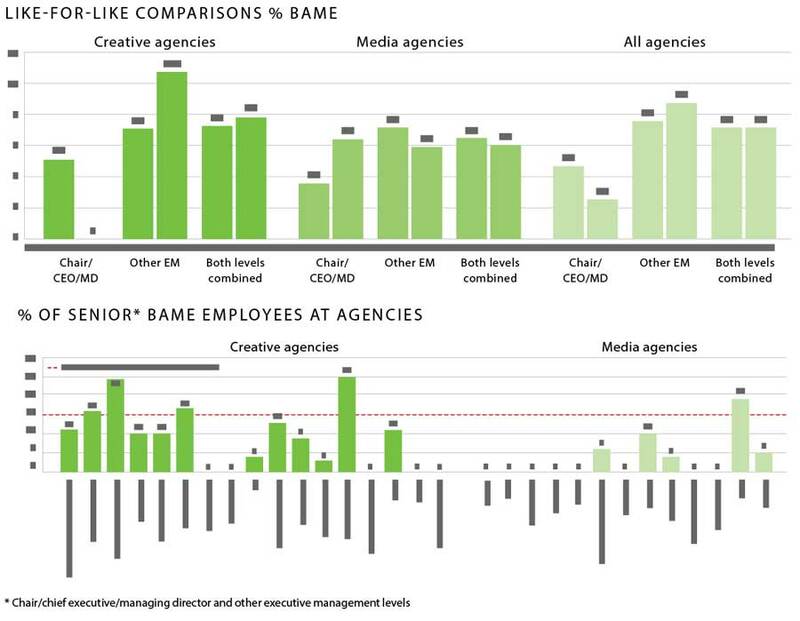 But creative agencies large and small have a similar representation at the top level – 5.5% and 5.2% respectively. In larger creative agencies, the overall percentage of BAME individuals in the top two tiers has dropped from 9.8% last year to 7.7% this year. Within media agencies, the figure for the top two tiers has also dropped slightly from 5.6% in last year’s survey to 4.4% this year. 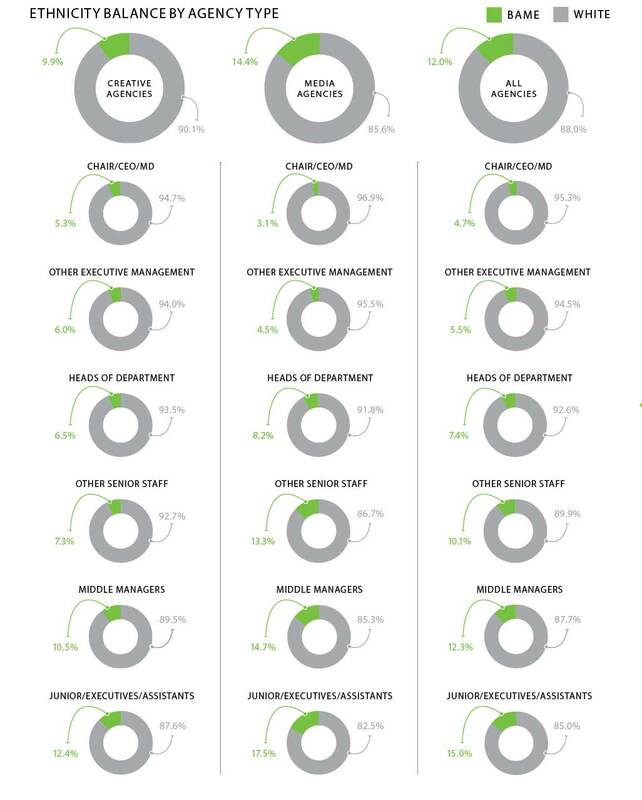 In small media agencies, there are no BAME individuals at the top level but 5.1% in "other executive management". These figures grow as you go down the seniority levels from 11.4% in heads of department to 19.8% in the most junior tier. A similar trend is seen in the large media agencies. At the top level, 4.5% of staff are from a BAME background, 4.4% in "other executive management", 7.4% in "heads of department" and 17.2% in the most junior category. Among the IPA agencies that took part in the Census, the percentage of BAME employees was 12%. This is below the 15% target and also slightly down on the previous two years. But it is up from 6.1% in 2007, when the IPA first started monitoring ethnic diversity. Twenty-three agencies submitted ethnicity data in the first and second diversity surveys. We have isolated the data from these agencies to check progress. The picture is more mixed than that for gender. This can be partly explained by the lower starting numbers, which mean one individual change can have a disproportionate effect on the total figures. Overall, the percentage of BAME employees in the top two tiers remained the same at 7.1%. Breaking this figure down, the percentage of BAME individuals has risen from 7.7% to 8.6% in the "other executive management" category, but has fallen in the top level from 4.6% to 2.3%. In creative agencies, the percentage of BAME employees in the chair/chief executive/managing director level fell from 5.3% to zero, but it rose from 7% to 10.7% in the second tier. The change at the top level may be explained by the lack of Publicis Groupe agency data – when the absolute numbers are so small, it can have a disproportionate effect on the figures. Media agencies saw a rise in the share of BAME individuals in the top level of seniority from 3.7% to 6.3%, but a drop in the second tier from 7.3% to 5.9%.